This is a glorious and large golden healer Lemurian quartz from the Serra do Cabral Mountains in Brazil, 2 lb 8.1 oz and 7" by 5.7" by 2.5" with side student and long, slanted and healed contact area. The golden color likely comes from iron coating (limonite) that would probably come off in a good acid wash, but this crystal has only been washed with soap and water. His color is a nice, subtle gold and really highlights fine Lemurian lines and vibrant, fiery rainbows! Plus he has some very tiny, but intricate starbrary glyphs and record keepers on his faces - you will need a loupe to see them well. There are some very tiny, but otherwise, he is in excellent condition. You will be enchanted and over the moon to the stars with his ebullient energy! Holding this wonderful crystal, I am washed with waves of joy and love - it's the kind of sensation you get deep in your Solar Plexus when you are content and comfortable - like coming in from a cold rain, putting on dry clothes right from the dryer and sitting with a cup of hot chocolate. But it's a feeling more than comfort. There is a connection to ancient teachers that pervades - as if you have a direct line to Spirit Guides as well as the Star Peoples. You are safe in speaking with them; fear is banished and you know the strong and true Spirit within you. This golden healer has an element of protection as well; your aura increases in size, pushing away negativity. He is absolutely potent! Interestingly, with his starbrary connections, he facilitates contact with Star Elders, again in a safe and protected mode. Of all emotions, fear generates the most negative power and people do unbelievable things because of the fear they harbor within. When you can clear your psyche of fear, you proceed unclouded and open in mind, heart and Spirit. 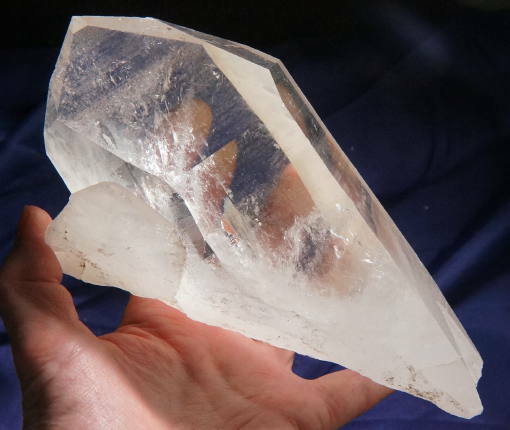 He is part of the amazing Lemurian crystals emerging now, gifts of the Star Elders to the people of Lemuria ... and our legacy as we usher in a new Lemurian age.